The three weeks of mourning are in full swing and Tisha B’Av, the fast day dedicated to remembering the destruction of the Jewish Temples, is fast approaching. It is a time for reflection about what the Temples and the Temple Mount means to the Jewish people, but can also be a time to be grateful for what we do have today: the State of Israel, access to the Western Wall, and (limited) access to the Temple Mount. We have the freedom to be Jewish in our homeland, and we here at the Sifting Project have the blessing to every day work with artifacts from the Temple Mount. We want to take this opportunity to thank all of the people who have already given in this year’s Annual Appeal for helping us continue to do this important and meaningful work and share it with you. Click here to donate to this year’s appeal and quadruple your impact. We also want to take this opportunity to thank a very special community. 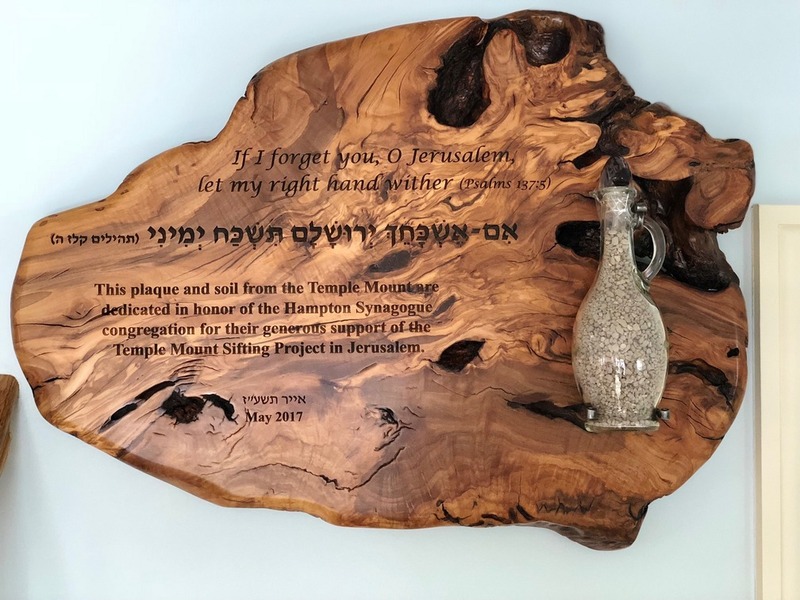 Last May, we had the pleasure of being invited to the Hampton Synagogue in West Hampton Beach, New York. This was at the height of our insecurity about the future of our project, and long-time supporter Mr. David Sterling, and Rabbi Marc Schneier of the Hampton Synagogue, made an appeal on our behalf. The congregation treated us with warmth and were so welcoming and generous, and we left the community with enough pledges to help us secure the funding we needed to complete last year’s research and the ability to focus on our goals and continue our research. This year, Dr. Barkay returned to the Hamptons and again received a warm welcome and promises of help. We have great respect and gratitude for all of our donors, and some of you have really become like members of our TMSP family. Some of you have been with us from the beginning in 2004 and some of you are newer to our project. We are moved that our message of archaeological conservation and cultural heritage preservation affected you enough to come on board and join us in our mission. However, never before has an entire US community of people come together to make such an impact on our project, and we want to take this moment to say thank you. We learn from the tenth-century Rabbi Sherira Gaon that when Israel was exiled after the destruction of the First Temple in 586 BCE, the smiths, craftsmen, and prophets among them, were brought to the city of Nehardea in Babylonia. Jehoiakhin the king of Judah, and his entourage built there a synagogue and used for its foundation earth and stones they had brought with them from the [ruined] Temple [in Jerusalem] to fulfill the intention of Psalms 102:14. They named the synagogue Shaf ve-Yativ, meaning the Temple journeyed and settled here. * The Temple Mount ashy soil is the property of the nation of Israel and the world. We don’t see ourselves as the owners of this earth, with its rich meaning and history. We want to share it with you, our family of supporters. Congregations interested in a similar plaque and lecture series can contact development@tmsifting.org. Bowl of ashes used at wedding. The destruction of the Temples is remembered by Jews in so many different ways, and at so many different occasions. Jews remember the destruction in daily prayer, grace after meals, when building a new home, and at weddings in order that we commemorate the ongoing feeling of pain over the destruction of Jerusalem and the Temple. We have had many people, grooms and the grieving, asking us for this ash so that they can use it at weddings and funerals. Yemenite Jewish custom is to put ash on the groom’s forehead during the marriage ceremony when this destruction is recalled and Psalm 137:5-6 is said. “If I forget you, O Jerusalem, may my right hand forget its skill. Let my tongue stick to the roof of my mouth if I do not remember you, if I do not set Jerusalem above my highest joy.” In recent years this custom has been adopted also by non-Yemenite Jews. Others, like secular Israeli Yishai Rosenbaum from Oranit, believe that the juxtaposition of remembering the destruction of the Temples at happy occasions highlights our ability to bring joy out of sadness. Rather than tempering our joy with a moment of sad remembrance, it uplifts our sadness with the present joy and hope for the future. Our director, Zachi Dvira, also used Temple Mount ash at his mother’s funeral. There is a tradition that the children place a little ash on the closed eyes of the deceased, while reciting the verses “For dust thou art, and unto dust shalt thou return,” (Genesis 3:19) and “Joseph’s own hand shall close your eyes,” (Genesis 46:4). Most recently, we sent Temple Mount soil to be sprinkled in the burial of one of our biggest supporters, and we know that it brought comfort to the grieving family to have him resting in earth from Israel and the Temples. It is amazing how something as simple as soil or ashes can fire our imaginations or make us connect with history, our heritage, or the divine. May these three weeks of mourning be also a time of reflection, gratitude, and giving. Despite recent actions, may we never again witness destruction on the Temple Mount. Last 2 Days: Top Posts! 05. JPost: Was the Aksa Mosque built over the remains of a Byzantine church?